The hips, buttocks, and abdomen are areas of the body that are commonly resistant to diet and exercise efforts. Men often have fatty, enlarged breasts reduced with liposuction. The lower cheeks, jowls and upper and mid neck area may also be fuller than one desires from unwanted fat. Even women and men who lead an active, healthy lifestyle often struggle with isolated pockets of stubborn fat. With liposuction, our Saratoga Springs plastic surgeon, Dr. Steven Yarinsky, can alleviate this frustration and help you attain a more toned and sculpted figure. The new tumescent liposuction procedure can remove unwanted fat cells from the hips, thighs, and buttocks as well as other areas of the body. This body contouring procedure is not intended for dramatic weight loss. Liposuction is designed to target specific areas of the body that have proven resistant to more traditional methods of fat reduction. The results are noticeable almost immediately, and there is minimal recovery time associated with this procedure. “I consulted with 3 different practices. None of the others were as informative or caring as you folks. I left the other places with more questions than answers and the feeling that I had taken up too much of the doctor’s time. I left Saratoga Springs Plastic Surgery feeling like I could make an informed decision and would be in good hands.” – J.L. LipoPerfection is considered the next generation of liposuction. This advanced liposuction technique uses an extra step of applying high-intensity ultrasonic energy to the targeted tissues for 3-6 minutes before an incision is made. With this unique process, LipoPerfection softens the fat cell layer located beneath the skin and disperses the “tumescent solution” injected prior to ultrasound application to make the procedure almost bloodless. But most importantly, LipoPerfection tightens the overlying skin at the liposuction site, offering a significant advantage over more traditional liposuction techniques. What Are the Benefits of Liposuction with LipoPerfection? After the liposuction procedure, you will likely notice an improvement in the contour of the treated area or areas. In addition to achieving a more flattering figure or physique, many patients report that clothing fits better and that they have a boosted sense of confidence. Who Is a Good Candidate for Liposuction with LipoPerfection? Most liposuction candidates have excess fat in one or more areas such as the face, neck, upper arms, chest, trunk, abdomen, waist, hips, thighs, knees and ankles. Ideal candidates for liposuction are already at or near their target weight, usually within 20-30 pounds. Candidates should also be in good overall health, eat a nutritious diet, and exercise regularly. Liposuction is not a weight loss technique for treating obesity since the most fat that can safely be removed at one time is less than 10 pounds. However, the typical liposuction treatment removes much less than that, and you may not even notice a weight change on the scale. But your clothing should fit better and you will definitely notice an improvement in your body contour/shape. How Is the LipoPerfection Procedure Performed? Dr. Yarinsky preparing to use the LipoPerfection® Liposuction Machine. 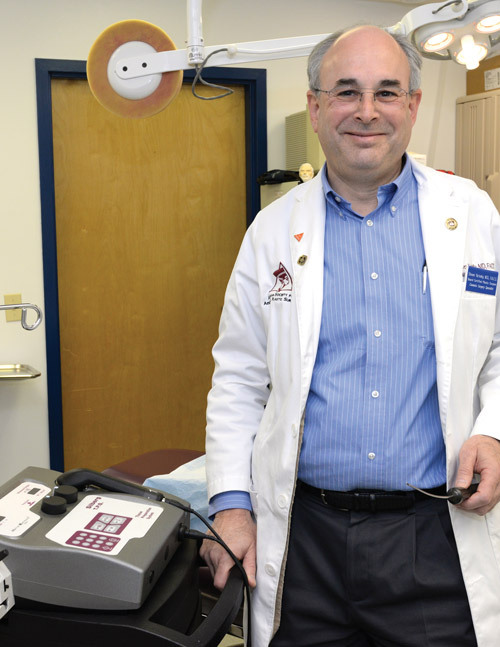 Dr. Yarinsky’s office is the only one in the Capital District, Upstate New York, Vermont and Western Massachusetts using the LipoPerfection external ultrasound assisted technique. The ultrasound energy is used to liquefy unwanted fat, allowing for easier removal, small incisions, and less bleeding. This also shrink wraps or tightens the overlying skin. Small suction tubes (cannulas) are inserted through the very short incisions placed in inconspicuous locations near the fat deposits, and excess fat is eradicated. The procedure is done in Dr. Yarinsky’s office facility as an outpatient procedure using local, intravenous, or general anesthesia. The procedure can typically be completed within two to three hours. What Is Liposuction with LipoPerfection Recovery Like? As with most surgical procedures, patients can expect mild bruising, swelling, or soreness. These side effects can be managed with oral pain medication and should resolve quickly. The LipoPerfection ultrasound treatment helps to tighten your skin like “shrink-wrap” so that the compression garment may be worn for 3-4 weeks instead of the standard 6 weeks. Patients should also experience less postoperative discomfort and bruising as well as attain a smoother contour with this new method. The results are typically more noticeable than those seen with standard liposuction. How Much Does Liposuction with LipoPerfection Cost? Each liposuction procedure is customized by Dr. Yarinsky to achieve the patient’s individual goals. There are many factors that can impact the total cost of liposuction with LipoPerfection, including which area or areas are being treated, the volume of excess fat, and whether liposuction is combined with a complementary procedure. Since there are so many variables, a firm fee estimate can only be given after medical/physical evaluation at their consultation appointment with Dr. Yarinsky. The average cost of liposuction ranges from $2,500 to $8,500 for the surgeon’s fee. After Dr. Yarinsky has determined your specific needs and created a personalized treatment plan, you will be provided with your complete liposuction costs, including the surgeon’s fee, anesthesia fee, and other related fees for use of our fully accredited office surgery center. We provide you with a “Global Fee” which covers everything except for your prescription medication, lab work (if needed) and preoperative medical clearance (if needed). For our patients who might benefit from low monthly instalment plans with little to no interest, we offer a number of plastic surgery financing options. To learn more information about financing the cost of your liposuction procedure, please contact a member of our staff today. Additional procedures that may enhance your result and be done at the same time, often during a Mommy Makeover, are tummy tuck, breast reduction, breast enlargement, breast lift, thigh lift, or buttock lift. Endermologie treatments starting several weeks after liposuction can dramatically improve the results. We recommend Endermologie treatments for all of our liposuction patients. These procedures are done at our Joint Commission accredited office facility. For more information about liposuction or to arrange your private consultation with Dr. Yarinsky, please contact our office.